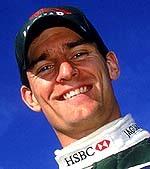 Autocar magazine, part of the Haymarket Group which owns Autosport, has named Australian racer Mark Webber as its F1 'Driver of the Year' for 2003. A year after making his F1 debut with the struggling Minardi team - finishing fifth in his first ever Grand Prix - the Australian slipped effortlessly into the Jaguar team where he generally had the better of team-mates Antonio Pizzonia and Justin Wilson. "If you're looking for a future threat to the established F1 order," read the tribute in Autocar, "look no further than this personable young bloke from Queanbeyan. "The hallmark of any great driver is an ability to wrench unholy speed out of a relatively slow car." Despite four retirements, all in the first half of the season, and a meeting with the barriers at a sodden Interlagos, Webber was remarkably consistent scoring points in seven rounds of the championship. Yet it was the new 'hot-lap' qualifying format, particularly on Fridays, where the Australian really shone. Every time the Jaguar star came out for that all-important run you knew you were in for something special and he rarely disappointed. Sadly on Saturdays as Ferrari, McLaren, WilliamsF1 and Renault got closer to the perfect set-up the Jaguar's flaws became all the more evident. That said, his average qualifying position of eleventh belies some remarkably fine performances particularly in Brazil, San Marino and Hungary. The team clearly adores him and fully appreciates his work rate and insatiable appetite for information in order that he, and thereby the team, might improve. Although Webber is contracted to Jaguar until the end of 2005 he has been linked with a number of teams in recent months including WilliamsF1 and Renault, where his manager Flavio Briatore is boss. Many eyes in the pitlane will be focussed on the 'bloke from Queanbeyan' in the months ahead.